They say everything is bigger in Texas, and the same holds true with golf. 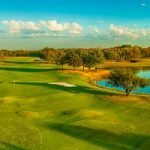 Texas Golf: The Best of the Lone Star State by Kevin Newberry, tackles the task of profiling the top courses in the state as well providing an overview of Texas golf history. The result is a Lone Star Success. This mammoth 544-page full-color coffee table book is surely the most complete ever written on golf in Texas. And probably the best. The book begins with a look at twenty-four of the Texas golf legends including Ben Hogan, Byron Nelson, Babe Zaharias, Lee Trevino, Ben Crenshaw, Tom Kite and Harvey Pennick. There is also a section on the Texas PGA Tournaments as well as famous Texas Showdowns. 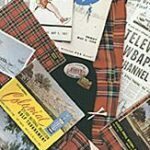 A summary of the history of Texas Golf is provided. This contains a look at events such as Mike Souchak’s round of 60, a PGA record which stood for 41 years, and Alan Shepard’s three shots on the moon with a six iron. The most impressive section is the in depth look at the Top 100 courses in the state. Each course has a full page photo as well as a one page review and description, which includes a scorecard and diagrams of the holes. 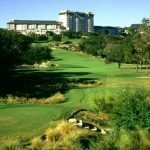 Standing atop Newberry’s list is Colonial Country Club in Fort Worth, which is followed by Crown Colony, Barton Creek CC (Fazio Course), The Hills of Lakeway, and Horseshoe Bay Resort (Ram Rock Course). Following the Top 100, are a full page on each of the 150 Three-Star courses. These include a half-page course photo. A half-page description is provided for the 200 Two-Star courses. The One-Star course section is basically an address directory. With over 800 courses to choose from, its obviously a difficult chore to accurately rate the top courses. Generally Newberry’s rankings coincide with others from publications such as the Dallas Morning News and Northern & Gulf Coast Golfer. Newberry mixes in the best of the newest courses in the state, such as The Bandit (New Braunfels), South Padre Island Golf Club and Texas Star (Euless), with the classics. Timarron Country Club (Southlake) seemed to be a surprise Top 50 selection. The Three-Star section includes historic courses that were once considered great. This might explain the mysterious inclusion of Z Boaz Golf Course (Fort Worth), which is rated the same as such courses as Legacy Hills Golf Club (Georgetown), Rockport Country Club, and Tour 18 (Houston). The North Course at Ridglea Country Club (Fort Worth) seemed to be underrated among the Two-Stars. But don’t let this mislead you. This hard-cover book is a great resource for any fan of golf in the Lone Star State. The full page photos are outstanding and provide an opportunity to see holes inside the gates of some of the most exclusive country clubs. A screen saver of twenty of the top holes in the state is included with the book. 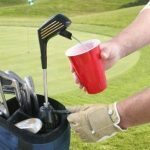 Golfing Nutrition: A Golfer’s Secret Weapon!